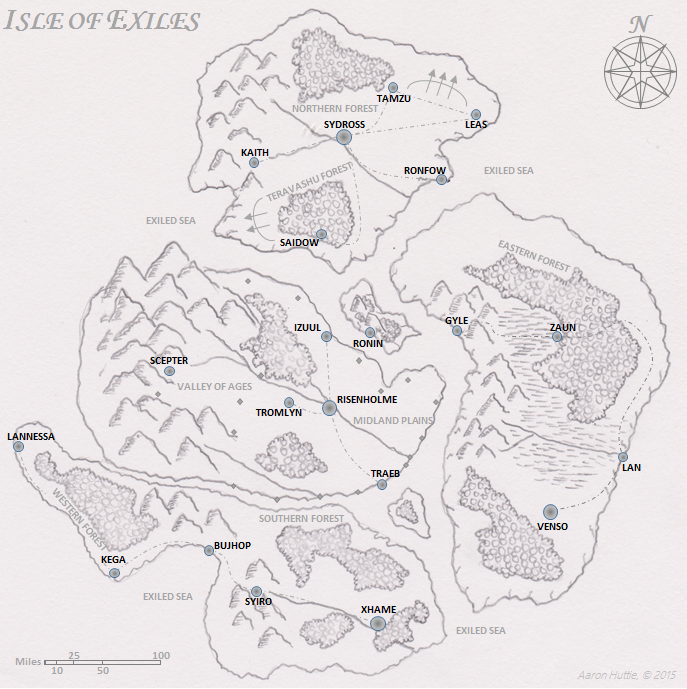 Though each province within the Isle of Exiles has its own system of government, the provinces represent humanity's last attempt at surviving the most recent cataclysm. There have been five cataclysms. Each has ended the previous age with a near mass-extinction. Most recently, something had crawled its way out of the void fractures that are etched across the world of Taeros. Whatever the fractures touched became a twisted version of itself that set upon whatever was next to it. Behind the void was an intellect and power far more fearsome than all of the horrors that came before. Cities that spanned continents were overwhelmed in days and flying fortresses of magic were brought down in heartbeats. According to common oral tradition, the last army was left behind - protecting the scraps of civilization that remained as they were evacuated through the Sanctuary Gate... to the Isle of Exiles.